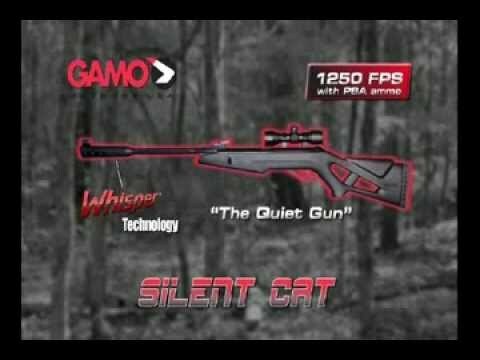 Whether you are just getting involved in hunting with air rifles or are a seasoned hunter the Gamo Silent Cat is an excellent choice. The Gamo Silent Cat is a .177 caliber air rifle that will certainly make you a fan of hunting with an air rifle, if you currently aren’t a fan that is. One of the great things about the Gamo Silent Cat is its shorter length and lighter weight make it easy to handle. Cocking effort isn’t too much either, despite the listings of 28 to 28 ft/lbs, most users find it to be more like 18 to 20 ft/lbs. What this means for you is that even if you fire 100 shots in a day chances are you won’t experience any kind of arm fatigue. Gamo has earned quite the reputation in the air rifle industry, and rightly so, we might add. When you purchase an air rifle manufactured by Gamo you know you are going to be receiving a quality product that you can rely on. The Gamo Silent Cat is one of their newer models, but is manufactured with the same quality and care as all of their previous air rifles. And, to show you just how serious Gamo is about their quality products they offer a full one year warranty on the new Gamo Silent Cat, so if something does go wrong you are totally covered. Manufacturer reputation goes a long way, but even the best manufacturers can come up with a dud every once in awhile. However, the Gamo Silent Car air rifle is far from a dud. This air rifle has never once let anybody down and is actually made to withstand all of the elements. Now even though most owners of the Gamo Silent Cat find it to be an outstanding air rifle, you are going to run across people who are not happy with it. What you need to remember is that no matter what the negative comments are, Gamo manufactures very solid and dependable air rifles, including the Silent Cat. The last thing any hunter or air rifle enthusiast wants to deal with is an unreliable air rifle, they want something that is not only going to fire every time they shoot it, but they also want something that is going to be able to hit the target. Hitting targets has more to do with accuracy, which we will discuss in a bit, but it also has to do with how reliable the air rifle is. Some air rifles can be hard to shoot because of the trigger adjustment, but luckily, the Gamo Silent Cat comes with an adjustable trigger to improve how reliable the air rifle is. Many users report that the trigger pull is a bit on the stiff side. The good news is that the trigger that comes with the Silent Cat is fully adjustable. Some users do take the time to adjust the trigger, while others have found that replacing it entirely with a new trigger is the best option. Another reason that this air rifle is one of the most reliable around is what it is made from. The Gamo Silent Cat is extremely durable thanks to its synthetic stock that is designed to withstand the elements. That means even if you leave it outside in a freak rainstorm, you won’t have to worry about any damage occurring. The durable stock also means you can take the air rifle out shooting in any kind of weather without having to worry about having to keep the air rifle dry. One of the most important things that air rifle enthusiasts look at when choosing an air rifle is how much power the air rifle has. Let’s be honest most people feel that the more power the air rifle has the better. How powerful you want your air rifle to be is really going to depend on what you plan to use the air rifle for. The Gamo Silent Cat is more than powerful enough to use for target shooting and plinking. Now we have never encountered an air rifle that is going to take out large game, but the Silent Cat is powerful enough to be used for small game hunting, as well as pest control. Best part is despite what others might think about a break barrel not being powerful enough for hunting the Silent Cat proves them wrong. With just one pump and PBA ammunition velocity can reach up to 1,200 fps. Now if you use it for hunting chances are you will be using standard .177 caliber lead bullets, which with those velocity can easily reach up to 1,000 fps. So in looking at those numbers it’s safe to say this air rifle is powerful enough to get the job done and then some. Accuracy is probably even more important than power when it comes to air rifle because if you can’t hit the target it really doesn’t matter how powerful your air rifle is. Now with the Gamo Silent Cat you are going to have to fire a few rounds to get the air rifle zeroed in properly, but once you sight it in you will be able to hit your target just about every time. To improve the accuracy the Silent Cat comes with a 4 x 32 scope and mounts. The stock scope is pretty decent, but obviously, you can replace it with a higher powered after market one, if you decide. The stock scope works well enough to ensure accuracy at 200 feet out, but to help keep the scope mounted in place it is recommended to use some Loctite on the screws. Something else to keep in mind in regards to accuracy in regards to the iron sights and bright light, with bright enough light the iron sights kind of blend into the scope, so it makes it a bit harder to see them even with how bright the fiber dots are. Cost is something that everybody is worried about these days; they want to make sure they are getting what they are paying for. If you look at the price of the Gamo Silent Cat and then compare it to everything that the air rifle is capable of doing, it is fair to say that you are getting a great value for the price you are paying. The air rifle is quite affordable, especially with how powerful and accurate it is. Plus with the one year warranty and the Gamo name you can rest assured that the air rifle is going to last long than just a few weeks. In looking at everything that the Gamo Silent Cat has to offer, you really can’t complain about this air rifle. The air rifle is powerful enough to use for pest and varmint control as well as small game hunting. Even better is the fact that the stock scope is powerful enough to ensure accuracy at 200 feet.